Oakland, CA—As government officials from around the globe descend on Washington D.C. this week for the World Bank’s spring meetings, a new brief by the Oakland Institute urges member states to deliver the final blow to the Bank’s ranking programs—the Doing Business Report (DBR) and Enabling the Business of Agriculture (EBA). The DBR and EBA face a growing crisis of legitimacy and confidence. 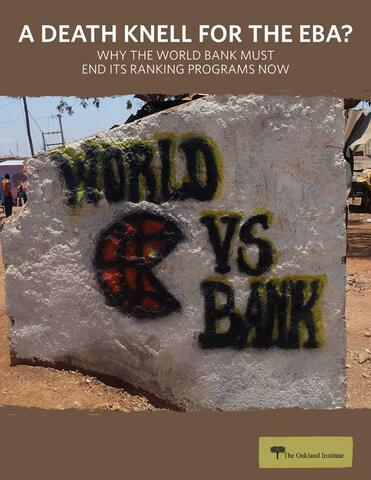 Since last year, two anchor donors have ceased funding the EBA; in January 2018, former World Bank Chief Economist Paul Romer resigned after exposing politically motivated manipulation of the DBR rankings in Chile, leading the country to demand a full investigation of the rankings. 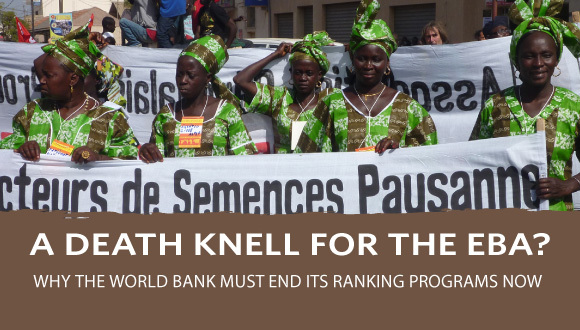 In February, France withdrew from the New Alliance for Food Security and Nutrition (NAFSN), another pro-corporate initiative closely related to the rankings. Just three major donors to the EBA remain—the UK’s Department for International Development (DfID), the US development agency USAID, and the Bill and Melinda Gates Foundation. All three are the primary drivers of the same pro-corporate agenda that the Bank’s business rankings push, and have used their power and influence to create in-roads in agriculture to further profits of major agri-chemical corporations. The brief echoes the call that the multi-continental, 280-organization-strong Our Land Our Business campaign has made since its inception in 2014.